That sums up the incident perfectly, except by sheer luck everything turned out just fine and we can all learn a lesson without a huge tragedy. 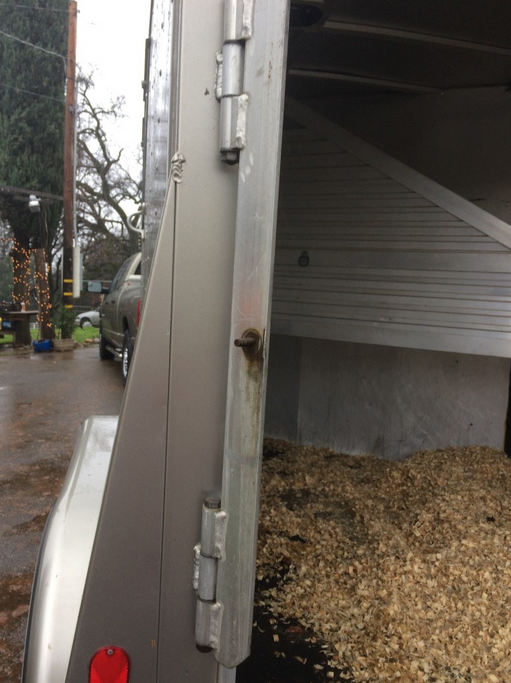 On Saturday morning I pulled into the Aurora‘s driveway to drop ML off for mare camp, shut off the truck, and headed to the back of the trailer to unload ML. Just like this (except ML was in the first stall – she’s unloaded in this picture). 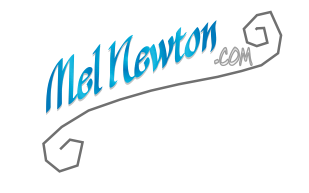 The nut that bolted the door retention bar had rattled loose on the country roads….and the door had opened. While my “worst trailer fear” centers around a horse putting a foot through the floor, my husband constantly worries about this scenario. He hates having a horse in the back stall if there’s an option to put them up further, and refuses to pull my trailer unless the horses are tied and the dividers are closed – all of which I did today, and are the reasons everyone is safe and sound. I watch my mirrors like a hawk, especially while making turns and there was some traffic on the road and no one indicated anything was wrong (small rural community – SOMEONE would have honked) so my best guess is that the door mechanism finally gave way as I was pulling up the drive way. I got lucky. If the weather had been nicer I was going to bring both Farley and MerryLegs and get a ride on Farley at the local trail head. We are in the middle of the “storm of the decade” (rolls eyes) and the trails are REALLY wet so I skipped the ride today and so Farley was NOT in the back of the trailer. I don’t often trailer without the horses tied or the dividers shut, but I have done it with Farley occasionally. Today, ML was in the front stall tied with the divider firmly shut. 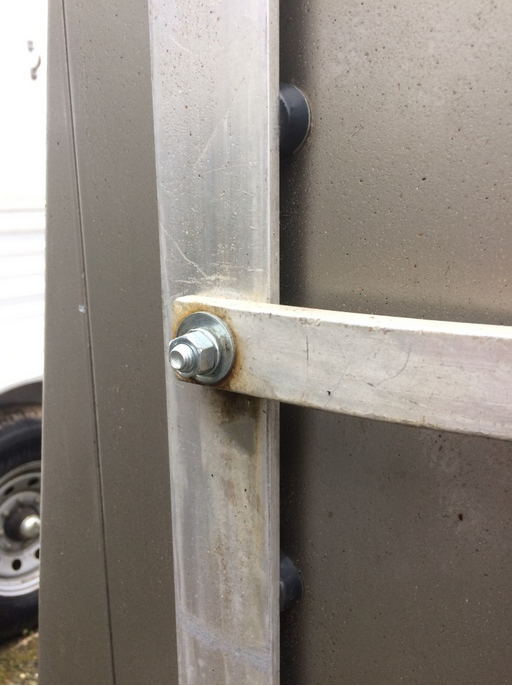 The only “fault” in myself was not recognizing that the trailer door didn’t have a secondary latch as a fail safe in case the primary one failed. Some trailers I have owned have had one and some haven’t so I didn’t think anything of it. The carabiner was an additional security for the primary latch, but didn’t count as a secondary. Something as simple as a latch from a hardware store screwed onto the edge of the door could have prevented this from happening. Definitely NOT appropriate as a primary door closure, but as an emergency back up it would have (probably) kept the door closed until I had a chance to see something was wrong. Of course in hindsight, the bolt and nut is being replaced with nylalock nut and bolt and it’s a “maintenance” item I will check regularly. If the worst had happened and there had been a horse in the back stall, I use breakaway ties in my trailer. 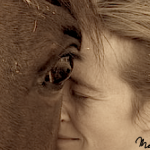 They won’t release when the horse does normal jerks and pulls, but if a horse goes down….or falls out the back…. they will release (and leave a tab on the halter). 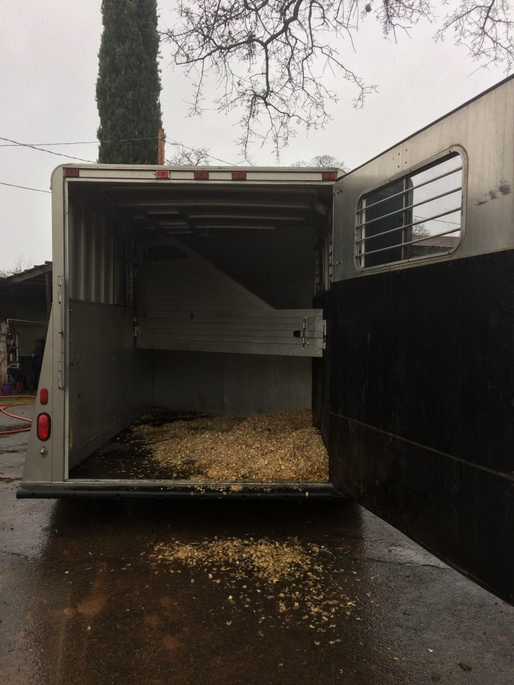 There’s rarely a perfect solution to every potential accident that could befall a horse, but in most cases I think a breakaway tie in a trailer is a good idea. FWIW I think that baling twine breaks (or doesn’t) unpredictably and I prefer to use ties that are designed for this use. My ties have been tested a couple of times over the years and can be put back together and reused after releasing. Here’s the ones I use. As endurance riders we are hard on our trailers (and vehicles) and we use them often. I think that’s why more weird sh*t happens to our horses and our equipment even though I feel as a group endurance riders are educated and work hard to prevent “bad things” from happening. It’s very difficult to put together a list of hard and fast “rules” that apply to everyone’s individual situation to prevent every accident. In fact, by preventing one thing we could be increasing the risk of something else! 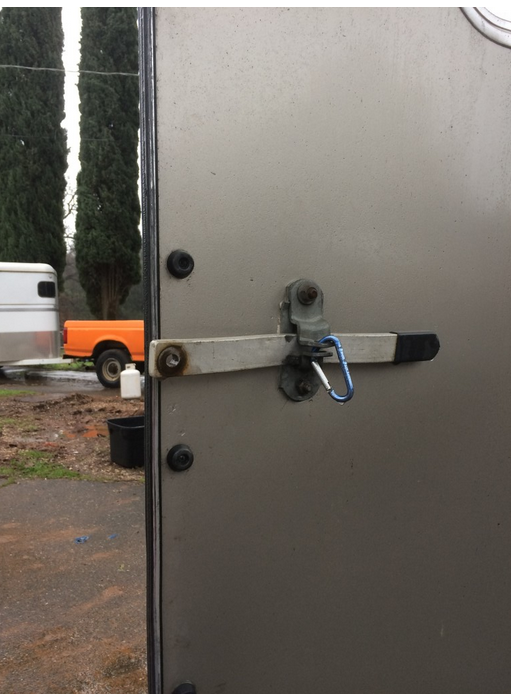 However, I don’t think it would hurt to take a look at how your trailer latches, and if there’s a single point that could fail and cause the door to open (notice that it wasn’t the retention system that failed on mine – it was a single bolt/nut that failed) either add a secondary safety latch, or make that single fail-point a regular part of your trailer inspection. Temporary bolt and nut (with locking washing) that got me home. How scary. I’m glad ML was safely in the first stall and nothing bad happened. So glad that everybody is okay! Merrylegs seems to be the near miss pony! Now THAT is a scary idea. So sorry you had such a scare! I try to check the nuts and bolts frequently – at least before each trip! If $ were no object I’d add a ramp for added security at the back of the trailer. You BETCHA I’ll be carrying a wrench and checking bolts regularly now!!!! I need to inspect the trailer really well and identify other risk areas. So food for thought…I actually had a ramp break on me. It was spring assisted and the hinge broke so that it lifted the ramp corner up above the level of the floor. I was away from home, with two horses, and a ramp that was really unsafe to both load and unload on to an no cell phone reception. That sorta put me off of ramps unless they are not integral to the closing the trailer (with that trailer if the ramp was down or off that part of the trailer was “open” ) and they need to hinge below the level of the trailer. Not saying that having a ramp on top of the doors isn’t a good idea, but it’s so true that whatever will fail with horses will fail :(. Glad it came out OK Mel. Also good suggestions here and will be checking our trailers for this type of fail safe. 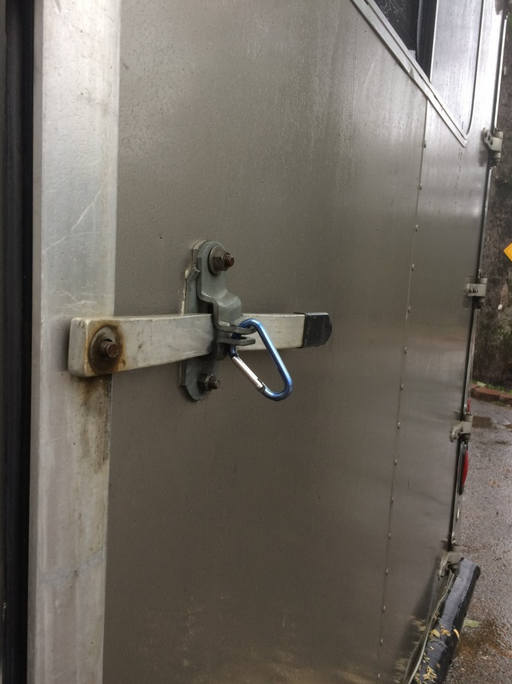 The two-horse we use for most events does indeed have a safety latch that is always use. Do also like the thought of using the divider latched for only one horse inside. Would have saved me some trouble last week when opened the back door and that was the signal for BG to come out before we were ready. Not good. Hot damn. That’s a close call. I’d be shaking my head for weeks about getting as lucky as you did if that happened to me. How remarkably fortunate that it worked out in the manner it did. So scary!! I have loads of irrational trailering fears myself, but I am really happy that it turned out to be okay in the end. I cannot believe that no one tried to let you know!! At least it all turned out okay! Did you retrofit a hardware store sourced latch screwed onto the edge of the door? I can’t get a metal image formed as to the “right” style of latch. « Monday Media Q: 50 or LD first?